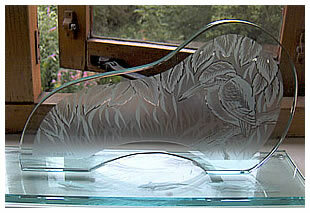 Hand cut and polished glass sculpture. Hand engraved depicting Kingfisher in triple acid etch. Deep carved sandblasting fish to underside of base. Upper face of base acid wash treatment to give the impression of water. 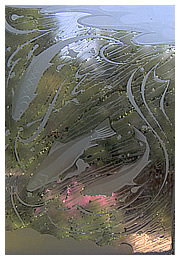 Bathroom windows with triple acid etch background, deep carved sandblast details to fish with shaded sandblast over satin wash. Commissioned by: Mr and Mrs Skinner of Reading, Berkshire.